Thank you for using Finedine. If you have any questions that are beyond the scope of these following instructions, please feel free to use our Community Forum. Click on Add New button at the top of the page. Search for “Finedine” in the search box and download the theme from the results shown. Click on Install Button when you see Finedine Theme listed in the search result. Once the installation process is complete, click on the Activate Button to activate Finedine Theme. Once the theme has been activated, you’ll be redirected to our Finedine’s welcome page. Download a theme from wordpress.com – a compressed .zip file will be downloaded to you computer. Use FTP to login to your site and upload the theme folder to the wp-content/themes/ folder. 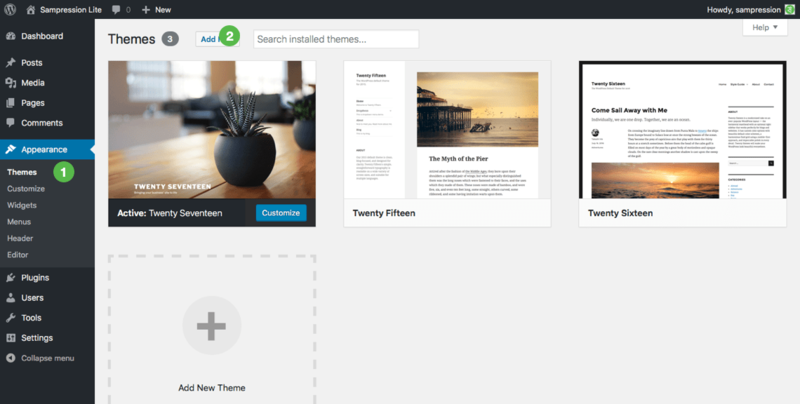 Open your WordPress Dashboard and go to: Appearance › Themes and activate the theme. When ever there’s an update for Finedine Theme, you will receive a notification on your WordPress dashboard. To update to the latest version, simply click on the Update Now link. To make any customization to your website can be accessed via the Appearance > Customize section. The customization options will be shown on the left menu (1), while you can preview the changes to the right main window. You can also directly click on the Edit icon on the main window to go to that particular section and make your changes (2). Go to Appearance > Customize > Finedine Important Links to find information about the Finedine theme, links to Online Support, Documentation and the Community Forum here. 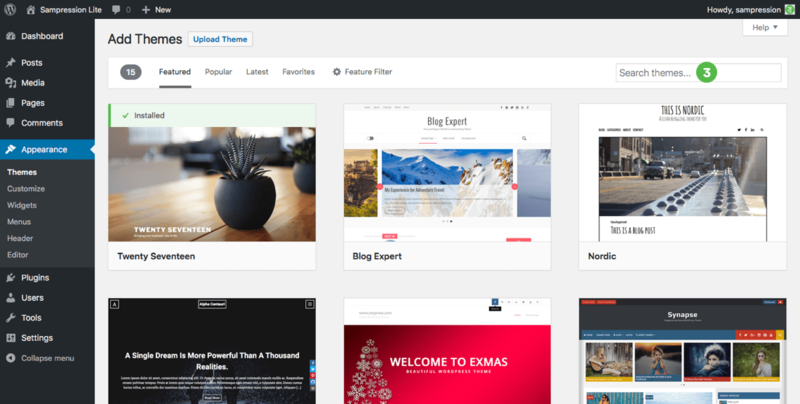 Theme Option is packed full of theme setting, styles of your website, including header options, featured slider, testimonial and reviews, social media and so much more. To change the content of your header, go to Appearance > Customize > Theme Options > Header Options. If you do not want to show content in the Header Section, you can leave the fields blank in the template. Finedine has support for Featured Slider. To display your posts in the slider, go to Appearance > Customize > Theme Options > Featured Slider. The Featured Slider in Finedine shows posts based on a category that you have selected from the dropdown list below. You can create a specific category (e.g. slider) for the posts that you would like to show in the slider and select that category from the dropdown menu below. For best results, we recommend that the posts have Featured Images set. Please note that you’ll need to add the excerpt text to your posts in order for the slider to display the second heading. Finedine gives you the 2 different Transition Effects, which can you can selecte from the drop-down menu (1). You can hide the slider form the homepage by choosing the hide option in Hide Slider section (2). Finedine offers two different layout options viz. Left Sidebar and Right Sidebar, from which to choose. To select a layout, go to Appearance > Customize > Theme Options > Default Layout. Finedine has support for four of the most popular social media. To add your account, go to Appearance > Customize > Theme Options > Social Media. To change your footer content, go to Appearance > Customize > Theme Options > Footer Options. We can only use js script in this section. To add your custom scripts, go to Appearance > Customize > Theme Options > Header and Footer Scripts. You can customise your site’s identity in this section. Finedine supports both graphic and text-based logos and also has Site Icon also known as Fav Icon. To add your logo, go to Appearance > Customize > Site Identity. To change color of your site, go to Appearance > Customize > Colors. You can change the Header Text and Background Color for the site here. To add a Header Image, go to Appearance > Customize > Header Image. There is no limit to the size of the image you can upload, however, the recommended image size is 1366×400 pixels. Finedine can display menus. To customize your menu go to Appearance > Customize > Menus. Finedine supports Widgets. To add or customize your widgets go to Appearance > Customize > Widgets. Finedine comes with two custom widgets, SM: Featured Block and SM: Call for Action Block. You can also add default widgets of WordPress.